Getting customers to be loyal to your car wash is the key to a successful operation and WALS gives you the opportunity to build customer loyalty! Using WALS, car wash operators can securely manage loyalty programs, customer accounts, and gift accounts over the Internet using a standard Web browser. 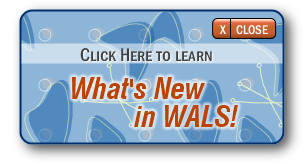 WALS works well for the single-location operator and is especially tuned to those with multiple locations. WALS also has several powerful marketing features that increase the car wash frequency of each member. For more information about joining the WALS program, call us at 1-800-227-3373. © 2003-2019 PDQ Mfg., Inc. All Rights Reserved.